It’s Friday! And therefore time for another weekend competition. Today’s prize features several copies of Get Set! 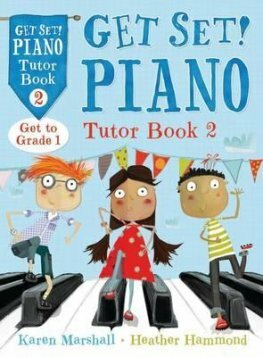 Piano which is a tutor (or method) book series published by Bloomsbury and written by Heather Hammond and Karen Marshall. Tutor Book 1 is accompanied by Pieces Book 1, and there is Tutor Book 2 and Pieces Book 2 as well (I’ve a copy of each, therefore two lucky readers will receive either both Tutor and Pieces Book 1 or 2), and this combination provides lots of material for beginners. Posture, hand positions and improvisation with teacher are highlighted, as well as writing exercises and simple, but effective illustrations. The thumb is introduced sparingly, and little tunes are slowly incorporated. As usual, all you need to do is leave a comment in the comment box at the end of this post, and Heather Hammond and I will select two winners on Sunday evening (British time). You can find out much more about Get Set! Piano here. Previous So You Want To Organize A Piano Competition? This book looks interesting!would love to get if for my students to use ! It sure looks gorgeous. I’m always looking for new material, and have always appreciated British methods. I wish they were more widely distributed in the USA. Betsy, Bloomsbury have made this series available via Amazon in the USA. Many thanks for your kind comments. Always on the lookout for new approaches to beginner teaching and what jumped out of the page was the ‘sparing use of the thumb’. Would love to check out this series. I’m starting a new student next week and I’ve been wondering if I should try out this series. It would be great to be able to show him this set next week at his first lesson. I’m always on the look-out for new approaches. The series appears to be well thought out. Love the teacher’s guide with explanations supporting the approach. Hi Debra, Many thanks for your kind comments about my classes at the OMWPA, much appreciated – I sure hope to be at the 2016 course! great idea! I d love to see the books! Ooh, this is a new one to me! Crossing my fingers…. It looks great. I am always in the lookout for new materials. Would love to win this and try with my student. Wow! That looks fun! I have just the right student for it! Sounds fun! I need this!! Pick me! I like the colorful layout of the book of Tutor book 1 (I saw the you tube link when students are playing with). I wish to win a copy so that I could have a closer look and explore the concept and the sequence of this method. I am always looking for new beginning books. Sometimes it is a challenge to find the perfect fit for that certain student. This one looks like it will be a good one! Yes, I am always open to look and find new music. This book looks like a creative fresh approach to teaching young students. I would to love to win it if possible, as I could utilize the new methods discovered. Thank you. I love investigating new music for my students. Keeps me on my toes, too, so that I never fall into a rut. Thank you for introducing us to this music. I’m looking for a new method book. Would be very interested in discovering this one. Is it available in Canada? Yes it is available in Canada via Amazon. Many thanks for your interest in the books. 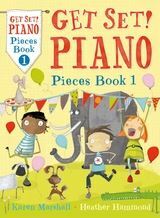 These look ideal for young beginners – I’m always looking for material that is suitable for small children, especially those who find use of the thumb and ‘five finger’ position still tricky to achieve. My daughters keen to learn. My daughters keen to play. Maxed out is the credit card. So please, send the books my way! These books look wonderful! I’m always on the lookout for great method book options. Thanks! These look good, would love to try then out. Thanks for another great opportunity! I’m in the process of restarting my piano studio. So far (as expected) I have all beginners. Having more beginner materials at my disposal is always welcome! Thanks to Heather and Karen for sharing as well! Hope I’m the lucky one! We went to the animal fair 😁 use this series a lot already as move nicely from dogs and birds book 1. The pictures are great and we all love Suzie Staccato!!! Thank you, this would be a lovely gift! Get Set tutor books have the most musical approach to learning I have seen and are suitable for all types of learners. The foundations of music are laid thoroughly in easy steps with lovely illustrations and music. Get Set tutor books not only make learning music enjoyable for beginners of all ages but are an excellent resource for teachers. I would love to have a copy of this! I’m looking for a new method to use with my students. Elissa Milne recommended these books at a seminar I attended and it would be great to be able to try them out. Thank you.